Spectacular Oceanfront Condo-Luxuriously Designed Interior AC available! Searching for a SPECTACULAR OCEANFRONT CONDOMINIUM in the magnificent north shore of Kauai, search no further. St Regis (formerly Princeville Hotel) is Pu'u Poa, our ocean bluff condominium home that offers a magnificent vista of endless Pacific Ocean. Located in the resort community of Princeville, this premier oceanfront condominium features an amazing panorama where majestic mountains and spectacular ocean meets. It is truly one of the most incredible spots in the world. Enjoy dramatic views of the ever-changing ocean. Stunning scenes of glorious sunsets over Bali Hai. 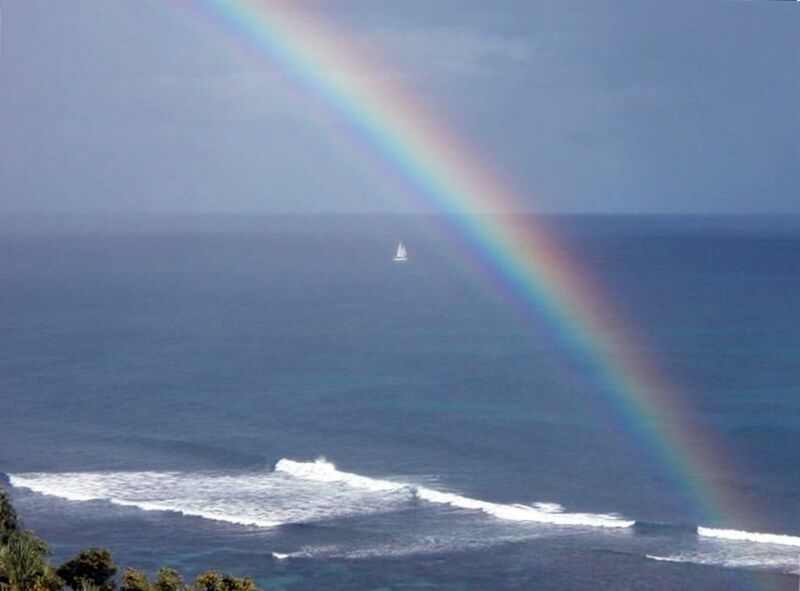 Dazzling rainbows right from your condominium, and whale watching as they play on the Hawaiian waters, when in season. This luxurious condominium offers a spacious, 2000-plus square feet of beautifully designed interior that is romantic and luxuriously comfortable. The splendid, carved glass, double door entry will welcome you to an oceanfront vista that can be viewed from the living room, atrium, master bedroom, grand gourmet kitchen, and a huge lanai overlooking legendary Bali Hai (a vertical mountain peak made famous by the classic movie South Pacific). Luxurious furnishings, exquisite lighting, beautiful artwork, large flat screen HDTV CD/DVD player, and an extra-large, grand, gourmet kitchen will add to your enjoyment of this magnificent condominium. Kauai's magical north shore is enchanting with its ocean breezes that create a euphoria like no other place on earth. Enjoy romantic escapes for honeymoon, anniversary, or any special occasion, or just get away to treat yourself. Your most memorable life event deserves the very best. Pu'u Poa condominium complex is located on a bluff overlooking the blue Pacific and is one of the most scenic places on earth. It is well built with thick concrete walls, floors, and ceilings to eliminate noise transference, and is complete with tennis court, swimming pool, and a trail to Hideaway Beach below (which is the second best rated snorkeling reef in Kauai). Next to Pu'u Poa is the five-star Princeville Hotel with gourmet dining, entertainment, and other amenities. There are two, top-rated, golf courses in Princeville. The 27-hole Makai course is within walking distance of Pu'u Poa and the #1 rated Prince course located at the beautiful Princeville Country Club and Spa which is a short drive. Within a few minutes drive you will find spectacular waterfalls, horseback riding, helicopter rides, incredible hiking, etc...! Two miles from Pu'u Poa is the Princeville center which includes restaurants, shops, post office, grocery store, and a gas station. Three miles from Princeville is the quaint and beautiful town of Hanalei with its many shops and restaurants, and magnificent Hanalei Bay with miles of sandy beach for surfing, swimming, or just strolling. Beaches abound: Hideaway Beach, the beautiful, romantic, tropical beach is located directly below our condominium home. Puu Poa beach is a three-minute walk. There is so much to experience within walking distance or within a few minutes driving from our home. Enjoy the best snorkeling at Hideaway Beach or Tunnels Beach. Rent kayaks, surfboards, or scuba diving equipment nearby, play golf, or take a hike to the most incredible hiking experience of your life at Kalalau Trail (this wilderness area is inaccessible except by boat, helicopter, or by this trail) - so wonderful and one of the fantastic hikes we have ever experienced. exclusively to measure guests AC usage during your stay. AC usage subtracted from your $600. security deposit. * Please refer to Rental Agreement for condo rules. Cancellation fee $250. One of the most incredible oceanfront setting you'll ever experience, the freshest air...the ocean waves that takes your senses to drift in relaxation..the most incredible feast to your eyes where the Bali Hai mountain meets the sea !!! Complimentary long distance phone calls to US Mainland and inter island . High end Luxurious linens and most comfortable romantic bed setting. luxury bath towels and beach towels provided. Most beautiful setting in luxurious comfort. Kurig coffee maker with multiple pods provided. Organic green and white teas provided. Ample choices of table settings and bar items. Tremendous amenities of things you would want in the kitchen. Super luxurious gourmet kitchen with ocean views . 7 x 7 ft elegant granite island with barstools. 8 ft white stone bar overlooking fabulous ocean views , next to comfy corner lounging area . HDTV with record your favorite shows and watch it later after beach time. Watch your favorite movies, rentals available from Foodland Market. I hated to leave. This is a very special unit in the best group of condos in Princeville. Fantastic views. Excellent amenities in the condo. The hosts clearly take pride in being super hosts. We had no issues during our stay. The hosts responded quickly to welcome us and any unit information was clearly presented. Thank you, hosts. FYI, hike to the private beach is a bit difficult for anyone with a handicap. There is a rope there and used to aid with climbing up and down. Hanalei Bay and access the the beach near the adjacent hotel are easy access options. This is a lovely spot with a wonderful view of the ocean to enjoy the sunset with easy access to wonderful beaches either on foot (Hideaway Beach) or by car. It's just a short ride to Hanalei town and beach which have plentiful restaurant options and the lovely Hanalei Beach. The hosts have put everything you need in the condo for a wonderful stay and were thoughtful to drop off a fruit basket during our visit. Flat was very well appointed with all the amenities you could ask for. Very clean, spacious and comfortable. There is no direct access to the beach, but there is a nice hidden alcove aptly called Hideaway Beach down a very steep path with some phenomenal snorkeling! Apt is right next to the Princeville Hotel (could walk in 5 mins). Great views of the mountains and sunset from the balcony. What a beautiful place with a wonderful view! Everything you could possibly need to cook or for the beach is provided. Zellie and Lloyd came by and brought us a welcome basket of fresh fruit also. What wonderful people! We really enjoyed our stay! The only thing we could have asked for is less rain! Would definitely stay again! Thank you Becky and Mark for choosing our condo. You both were great guests and what a pleasure to meet you both. Come back soon. We appreciated the bowl of fresh fruit, and the filtered water on the fridge. Nice hike down to Hideaways beach, easy walk (or elevators in the St. Regis!) down to Puu Poa beach. Thank you so much for taking the time to give us a review. And thank you for being such great guests. Come back soon. For monthly rate please ask owners. No kids and pets allowed. Minimum age 25 years old. No special events or parties allowed, just for quiet relaxing vacation . No smoking allowed. Rate of $425 is for two guests. Each extra guest pays $50 per night. Max of 4 guests only.